Pressure cook Hesaru Kaalu (may be 3-4 whistles ) and keep it aside. Heat half tsp of Oil in a pan, splutter Mustered seeds, add Curry leaves and Turmeric powder. Then add chopped Onion and saute it for 2 min. Add chopped Tomato and Methi leaves saute for 4-5 min. Then add cooked Hesaru Kaalu, Sambar powder, Red Chilli powder and salt to taste. Boil it for 5-6 min. 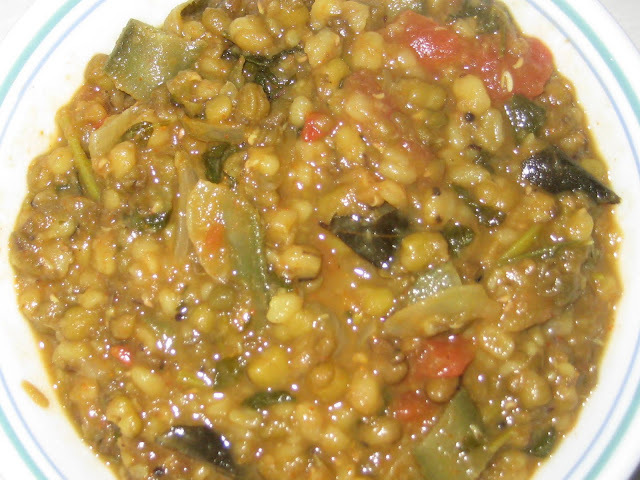 Serve with Chapati or Roti. Note: Chopped Beans can be added if you like. Wah.. looks delicious.. :) nanu try maadi hengagittu helti..